Blade for Thetford C200/C250/C260/C400/C500 + Holding Tank. Thetford part number 50731. The easiest repair is to replace the mechanism, our part 137137 for a left hand version or 137138 for the right hand. The mechanism can be removed by turning the whole assembly anticlockwise and lifting it away from the holding tank. 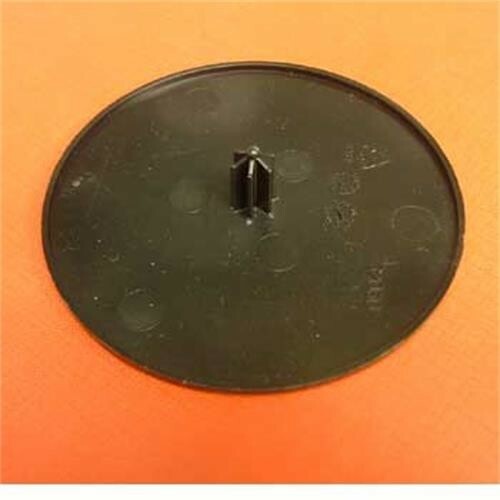 The black disc is known as the blade and is our part 137139 and if this is the only part broken then you may feel that you just wish to replace this part. Arrived in time stated and happy with service we received from this company. The item was as expected as a replacement part for our toilet which is 10 years old. Easy to fit after finding a useful video on YouTube. Had to change the blade, not a difficult job to replace, but the item is known to break. Thetford should strengthen the stud. Fitted spot on.easy to fit as removed lip seal for replacement,no need to take unit apart as instructions. the instructions to insert this item will make more sense when the blade assembly has been removed from the tank. follow the steps and you will get there. the centre post on mine had worn down and i was pleased to note that it had been modified and is more robust. Ordered the part on 10/20 and received it on 10/30. Exactly what we were looking for that we could not anywhere else. I'm really impressed, ordered this on Monday morning and it arrived on Wednesday! Like what others have said, the spigot had broken on the original part. This new one appears to be a stronger design. Supplied instructions (Thetford own instructions) are clear and this is a simple job to do. Delivered fast and genuine part. Not the most popular of jobs but the part came quickly and was easy to fit with clear instructions. Can we please agree now never to mention this again? Awesome, shipped to Canada and was far cheaper than buying locally too!! 'This Thetford blade replacement fitted easily and perfectly, with clear instructions on how to replace it. The delivery was next day. Unfortunately as with all items for motorhomes they are very overpriced. I am sure the manufacturers think we are cash cows! Does what it says on the can and saved me the expense of replacing the whole cassette. This is a genuine Thetford replacement part purchased to repair a C250 holding tank. It is supplied with instructions and is easily fitted. A first class service from Leisure Shop Direct - received within 24 hrs of placing the order. Thetford Cassette Blade. Efficient delivery. Clear instructions. Replacement was easy and works perfectly..
Just got the parts today, ordered from july28th and received on august 4th(im in canada)seems to be some improve parts. The service and support received from Leisureshop was incredible! I would gladly recommand this compagnie. Ordered the parts to be shipped to the United States. Parts came in about 2 to 3 weeks. No problem with the long shipping as this company had to order the parts from the manufacture and then ship them over seas. Very happy with the customer support! Like A Hot Knife Through Butter!! Difficult to get excited about Thetford cassete blades. However, they arrived in very good time and do the 'job'...so to speak. The blade had sheared off so presented with a mucky job. Thanks to Leisureshop Direct I found the replacement part with instructions so ordered. They did not advise that the item had been dispatch so I emailed but at the same time item was delivered. So a good dispatch service despite that issue. Was able to give cassette a good clean - warm vinegar removed scale along with a good hose down. Item fitted very easily so lubricated all seals with olive oil. Now have a sparkling cassette which is too good to use. Many thanks Leisureshop Direct. I got one of these last year after mine failed, easy to fit and cheap. It arrived quickly too. I bought another as a spare for touring, in case I have a problem while away. Well worth the money! This obviously replaced a broken blade from my existing toilet. The new blade has a more substantial build and shouldn't break again....it shouldn't have broken in the first place, but that's another story. Comes with comprehensive fitting instructions, so no need to google Thetford again! And finally, it was sent very quickly by Leisuredirect, so definitely no complaints there. This part was bought to replace the original: the peg broke off the disc. Finding the part needed was easy, from an exploded diagram. Being able to buy only the broken part avoided pointless expense. The order arrived in three days. Repair instructions were included. The repair took about 10 minutes. I wish more things were so easy. The part supplied is slightly different fro the original, and probably stronger. 5-star rating for part and service! Saved me a lot of money! One dealer told me the part was unobtainable,but they would sell me a new toilet!! Simple to fit,5 min.job. Dissapionted that the part failed-have emailed Thetford. The product match expectations and your shipment has arrived undamaged within a reasonable time, Happy .. Manufacturer, Thetford offers in Scandinavia only complete mechanism and would cost around 100 £. Thank you. The product was delivered quickly and fitted easily with excellent instructions. The price was good but a pity that delivery cost more than the part. It turned out that my local dealer had one in stock for 4.99 so I bought one as a spare. Arrived straight away and fitted easily. Thetford loo now back to full working order! Great to have found this product as it saved having to buy the whole mechanism. It looks stronger than the original too so might last longer. Easy to fit. Thank you very much for an excellent service. Good communication and quick delivery. The fact that I could purchase just the blade was excellent, saved me a lot of money. No problem fitting it, now work as new. Great service,arrived within 3 working days.Fitted it no problems. The fact that I could purchase just the blade was excellent, saved me a lot of money. No problem fitting it. Service as always is very good. I received the new blade within two days of ordering, great service....will be back. We received the new blade the day after we ordered it..........great service and we'll certainly be back for more. The blade itself seems to have had a design improvement and should be much stronger and last longer. We thought we were going to have to buy a whole new mechanism, so were very pleased that this cheap remedy was available. The Thetford 400 blade is a great product and very easy to fit. Great service,item arrived within 3 working days.Fitted it no problems. An improved design, but i suspect it may break again ( in a few years ) due to the pressure on the end of the spindle. Works great toilet now working as new. For around £6 delivered I might hold one in stock ! !